Industrial Abseiling is leading the way to provide a cost effective solution to access and carry out repairs on a building facade or structure. This includes bridges’ antennas used for commercial entertainment, television shows, and TV advertising. 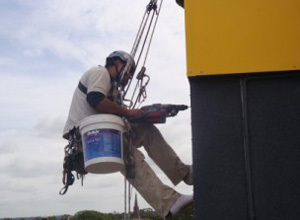 Using ASG’s industrial abseiling techniques, we will be able to properly service our client with the General Building Maintenance, which includes window cleaning; and, Full Facade Rejuvenation, which includes other type of work that require high rise access above ground works. General Maintenance includes window cleaning. Full Facade Rejuvenation includes facade painting, concrete repairs, and high rise facade repairs. Our team consists of certified and highly experienced personnel to carry out the most effective building maintenance work while implementing the safety guidelines and protocols. With our safety management plan in place, you will see our methods and techniques that provide a transparent form of business relations.